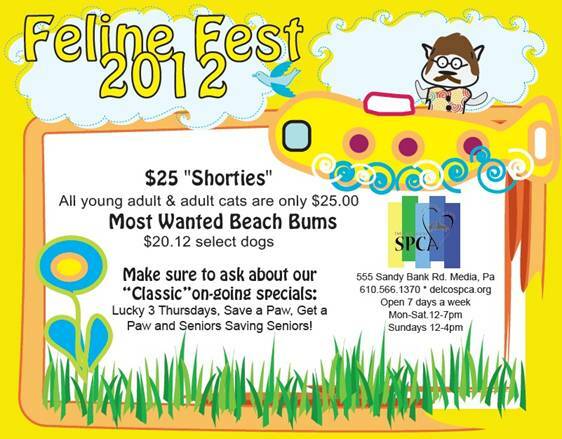 Feline Fest 2012 at the Delco SPCA!!! During the month of June, cat adoption prices for cats 6 months and older are nearly 75% off ($25). The fee includes vaccinations, spaying or neutering, a microchip, a complimentary vet visit, a 5-pound bag of food and a cat carrier. Motivating this month’s low-cost cat adoption opportunities at the Delco SPCA is the arrival of kitten season, which runs from early spring through the summer. During this season, animal shelters nationwide experience a surge in the number of cats that need forever homes. Additionally, the Delco SPCA is providing owners of cats with low-cost spaying and neutering services. 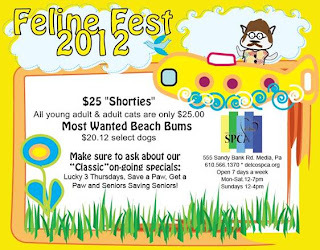 The regular low fee of $50 for a cat spay or neuter has been reduced to $35 throughout the month of June. Cat owners can make an appointment for the cat spay/neuter special by calling 610-566-1370 x3. According to statistics, one unaltered female cat and her offspring can produce 420,000 cats in a 7-year period, thus proving the importance of spaying and neutering. Visit the Delco SPCA Adoption Center at 555 Sandy Bank Road, in Media, to adopt a cat this June. Most adoptable cats cat be viewed at www.delcospca.org. The Adoption Center is open Monday through Saturday from 12 p.m. to 7 p.m. and Sunday from 12 p.m. to 4 p.m. Adoptions must be processed 30 minutes prior to closing.